If you are between the ages of 14 and 114, and are interested in military history – particularly the World War II era - then this is for you! A Venture Crew is a group which is organized under the umbrella of the Boy Scouts of America. Youth members are ages 14 – 20, with adults 21 and over. Adult leaders are to be certified and trained under the guidelines set forth by the BSA. Current members of the BSA are able to join a Venture Crew with a multiple membership with no extra registration fee. You don’t already have to be a member of the Boy Scouts to join this crew. The Crew will meet monthly on the first Sunday of each month from 1 until 4 PM at the MAPS Air Museum, located on the west side of the Akron-Canton Airport. Meetings may consist of a variety of things, including historical programming, guest speakers, equipment maintenance, preparation for upcoming events, training or practical experience with military equipment, field trips, service to the chartering organization, and other related activities. Youth members will be encouraged to adopt a person from history to “become” for living history events and demonstrations. 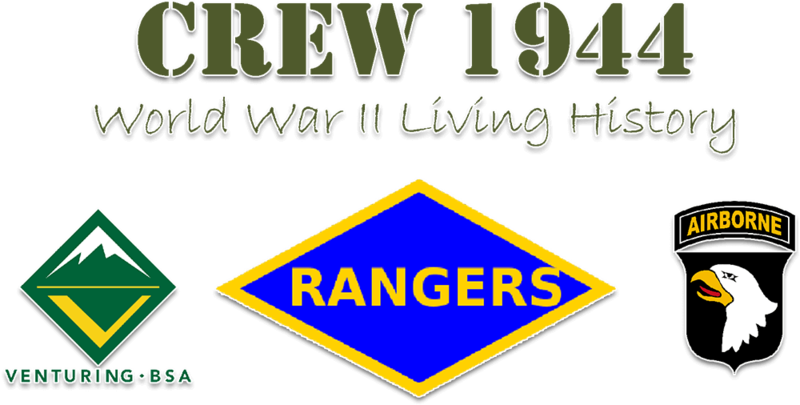 The Crew will participate in area and regional events which honor our military and its veterans, and will be affiliated with World War II reenacting groups, so that it’s members can participate in their activities as age requirements are satisfied. Parents of youth members are encouraged to participate and become involved as they are able. Crew members will be responsible to assemble the gear necessary for living history and reenacting events, including period correct uniforms, mess gear, bunking equipment, and other equipment necessary for their age and impression. The Crew will supply general equipment, such as tentage, cooking equipment, and group supplies.